I promised you the answers to by Christmas Challenge. It’s time to put you all out of your misery. Thanks to everyone who entered – I hope you enjoyed it. The big news is that no-one got 10 out of 10. Did I make it too difficult – apologies if so. But well done for persevering, those who tried. Can you work out my 10 favourite Christmas songs? Simply the best Christmas song ever! Don’t we all? Well maybe not quite every day. As many of you know I was a massive Wham! fan, and still am. My Wham! Rap, after a few beers, is the stuff of legend. Did you know, this is the best-selling single never to make it to no. 1? It was no. 2 for five weeks and was kept off the top spot by Band Aid’s ‘Do They Know It’s Christmas?’ (which doesn’t make my top 10 because I’m still upset about this! As I child I wasn’t allowed to get up before 6:00 am on Christmas Day. I used to put this on the record player (if you’re too young to know what one of them is then find an old person to ask) at full volume bang on 6:00 to wake everyone up. Now I have kids of my own who get equally excited about Christmas I can see how my parents must have hated me. There are lots of versions of this, but it’s Bruce Springsteen’s live version that got it into the top 10. Pa-rum-pum-pum-pum, need I say more? Actually, this is less a celebration of Christmas and was actually written as a protest against the commercialisation of Christmas. Brilliant! I’m sorry if the last one was too difficult. The clue was in the words “said” and “there’d”. If you Google “said Christmas lyrics” or “there’d Christmas lyrics” then this song comes top of the search findings. And at least I didn’t put In Dulci Jubilo by Mike Oldfield in the list. Thank you again to everyone who entered. I hope you enjoyed having a go. The best news of all is that a cheque for £200 is on its way to SOFII. And congratulations to Salma Mohammed at Refugee Action who was the first out of the hat for those that got 9 out of 10 and so a cheque for £50 is heading towards Refugee Action. So merry Christmas everyone, and here’s to a happy and successful 2013! I feel privileged and grateful to know that there are people like you who read my words in this blog. I hope you find my thoughts useful and / or entertaining. Like good fundraising copy, I must never forget that I’m writing for you, not for me. That’s my promise for 2013. But I’m getting ahead of myself. I am very grateful for everyone who has allowed me to be involved in their fundraising in any way and for everyone who follows my thoughts here or on Twitter in 2012. I had no idea what I was letting myself in for when I started working on my own, but I’m enjoying it a lot – thanks to you. I hope you all have a fantastic Christmas and New Year. And it’s not too late for me to receive your free entry to my Christmas competition, to raise money for SOFII and, maybe, win a donation for your charity. 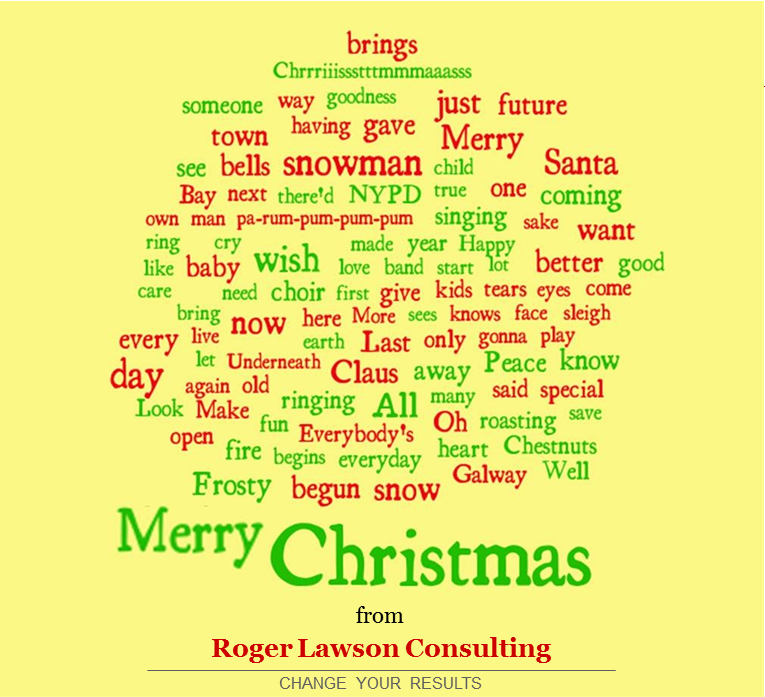 Just tell me the 10 Christmas songs with lyrics in this word-cloud. There’ll be one last post from me this year – the answers! A couple of days ago I wrote about the how the offer we make to the donor is more important than the ask we make for ourselves. Millions of donors feel good about themselves because they have saved lives, stopped animals being cruelly mistreated, helped find a cure for cancer and so much more. Donors have a passion to make a difference, and we help them do it. The world would be a worse place without us – not only for the causes we fundraise for but also for the donors we serve. People who don’t speak to donors (and I bet there are lots of them in your charity) don’t often get this – so it’s our job to remind them. Bring donors into the charity, invite colleagues to donor events, make sure everyone listens when you have research presented back to you. Let everyone hear the passion that donors have. That’s why fundraising is not a ‘necessary evil’ as someone described it to me the other day! We bring value to our donors that no-one else can. We bring joy into their lives too. That’s not evil – that’s something that I am immensely proud of. My first job in fundraising involved opening letters and banking cheques from people donating to help send aid to Bosnia in 1992. What I learnt then, from reading the letters from these generous donors, has stayed with me ever since. What we offer to a donor is immeasurably valuable to them. Often far more valuable than the face value of the cheque they were writing. It’s why I think it’s misleading to use the word ‘ask’. The best ‘asks’ we make are actually great ‘offers’. Of course, actually asking for their support is arguably the most important part of the fundraising process – just ask any successful Major Donor fundraiser. But what’s most important in this is what we can offer to the donor and what they get out of it. Again, ask that successful Major Donor fundraiser. At our best we make unique offers that no-one else can compete with. For £10 I can make a blind man see. Is there any other way of spending £10 that will make me feel that good? For €25 I could buy a webcam on the new Rainbow Warrior. Who said giving to charity can’t be cool? For £15 a year I can ‘own’ my own word – that no one else owns. I can even wear a unique T-shirt with my word on it. Or I can ‘sponsor a day’ at the Royal Marsden Hospital. Not just any day – a day that is really important to me. I’ve worked with charities, hospitals and universities this year helping them to create their fundraising asks (and yes, I’m guilty of having used that word!). No matter who you are, we need to start from the point of what can we offer to the donor? Remember, no-one else can offer the joy of giving and the experience of changing someone’s life like we can.